What is happiness and what makes you happy? To what extent can literature shape your personal philosophy on happiness and meaning? Part one: I found out that literature did not fully influence my philosophy, but that events in my life also influence me. Literature mostly realized what I already believed, like how in class when we discussed success is all about grit. It made me realize how much I value the effort that is put into work, and that just putting in as much effort as you can is how I define success. This also made me realize how my I value success, that one will be success in order to be happy. Being that successful in one's family life, or successful on a project. With all the literature we read in class just brought me to events in my life that defined my philosophy. Besides that I the other insight I got from this project was, learning how people describe success differently. I also learned about many different philosophies that people could have like nihilism. We also talked about existentialism to help us not focus on our religion if we had one, but think more as a existentialism. This lead me to the second part of my philosophy of being successful and trying to be the best you, you can be. How did this become my philosophy? Was this my philosophy only because of what has happened to me so far in life? ​What would be my philosophy if I wasn't a christian? “Even youths grow tired and weary, and young men stumble and fall; but those who hope in the Lord will renew their strength. They will soar on wings like eagles; they will run and not grow weary, they will walk and not be faint (Isaiah 40:30-31).” Somehow this quote seemed to fit my life perfectly. Somehow it was one struggle after another in my life with only rest periods of a year. Even with my life so far being short so far, I foresee this to be an ongoing pattern in my life. For a long time now my philosophy has stayed constant, Follow God’s word, and succeed in whatever matters to you. Though succeeding is not merely just doing the task as perfectly as possible and getting the best outcome. No, succeeding is trying your hardest and doing everything you can do for that task, and you don’t ever have to do the task better than anybody else, just better than what you normally do. Then finally to do whatever possible to make yourself the best you, you can make. All three of these ideals have shown in my life ever since elementary school. So let’s start at the beginning now, shall we? I was born in a small town in Texas called Frisco. Though this town was small seventeen years ago it is not that small now. With the town being 30 minutes away from Dallas it seemed to grow larger and larger as the years went by -- now it’s one of the fastest growing cities in the nation. Everything seemed to be perfect in the family the first couple of years, but as my sister, Reagan, and I grew up everything seemed to fall apart. I rushed to the door, hoping that it was unlocked, pushing the door opened. I yelled “hello!” waiting for an answer and finding none, I walked over to the garage and looked for a car. With no car, I found myself at home with just my great-grandfather, which wasn’t much different from being alone. I went to the living room planning on just watch TV till someone came home, every once and awhile grandpa would wonder in and out of his room like a zombie wanting food, but finding nothing alive in the house to eat. Even if I was alive it didn’t feel like it, everyday I was either working for school or staying home alone having a staring constant with the kitchen knives. Thinking everyday that I could stop this cycle of nothingness that was my life right now, but before anything happened, my mom and dad would come home at some time between 10pm and 1am, sometimes even later. The only times I would see my sister as well was when my parents were yelling at her as she just ignored them like nothing was wrong. This was everyday of 6th grade year, but suddenly everything seemed to get better after I went to church one Wednesday for the middle school small groups. It was time to pray in the service, and I remember crying, and praying about the situation at home and for my sister to get better. Then as Reagan started her freshman year in highschool she regularly attended church, and peace seemed to envelope our house once again.We were all together again and as the bible say “ Be devoted to one another in brotherly love. Honor one another above yourselves. Never be lacking in zeal, but keep your spiritual fervor, serving the Lord ”(Romans 12:10-11). Once we committed to this, everything felt whole again. After these events, I had established my faith in God. Before I was just told to pray to believe in him, and his kindness, but after that year of hell. I believed I was more connected with him than I ever had and I could feel it, it showed in how I acted. I started to get more friends because of the kindness he had taught me, and I started to truly have the best years of my life after that struggle. It was reading time in class now, everyone rushed towards the bookshelf to pick out their favorite books. Then there was me sitting at the table hoping I could get away with not getting a book, but once everyone returned to their seats, I got up and as slowly as I possible could, walked over to the shelf and picked up a random book. Once back in my seat I opened the book pretending to read, moving my eyes back and forth like my eyes were following the lines of words, not knowing what a single word was. After reading most people would talk to their friends about the book they picked, but I continued to “read” so no one would talk to me about the book that I couldn’t even read the title of. I hated having to read in school. All it did was proved I was different than everyone else. Almost every day I would get home and cry to my mother how I was different and how I could never be like everyone else, but I did find joy in telling her the color of everybody's socks and if people were having fights with their friends. Thinking about knowing everybody’s sock color is really weird, why not their shirts or shoes? The only reason I can think of was that I was always bowing my head, because I thought myself inferior than everyone else, giving myself the perfect sight to see everyone's socks at their ankles. I’m gonna do it! This year I’m finally gonna to do it! I’m going to read all twenty books! I head down to the library to check out the first book I was goin’ read, I decided I was going to start with the picture books first and slowly go into the larger books. I picked out Down, Down, Down: A Journey to the Bottom of the Sea By Steve Jenkins, it was all about deep sea creatures and it had a lot of pretty pictures of the fish inside. I finished that night and I was so excited to return the book and take the quiz for it, just to prove I read. So each day I choose a new picture book and took the quizzes, I ended up reading All Stations! Distress! : April 15, 1912: The Day the Titanic Sank by Don Brown, The Uglified Ducky: A Maynard Moose Tale by Willy Claflin, which was the cutest one about a moose thinking he was a duck, Surfer of the Century: The Life of Duke Kahanamoku by Ellie Crowe, Pirates by Dan Burr, 14 Cows for America by Carmen Deedy, The Hinky Pink by Megan McDonald, That Book Woman by Heather Henson, Sparrow Girl by Sara Pennypacker, The Fantastic Undersea Life of Jacques Cousteau by Dan Yaccarino, Tap Dancing on the Roof by Linda Park, Squirrel’s World by Lisa Moser. This was twelve books out of the twenty, and I was so excited I had read seven more than I did last year. But now I had to start reading the chapter books if I wanted to reach my goal. I had never read a chapter book before, but I knew I needed to read all twenty books if I wanted to really feel like I improved and gotten better with my reading. 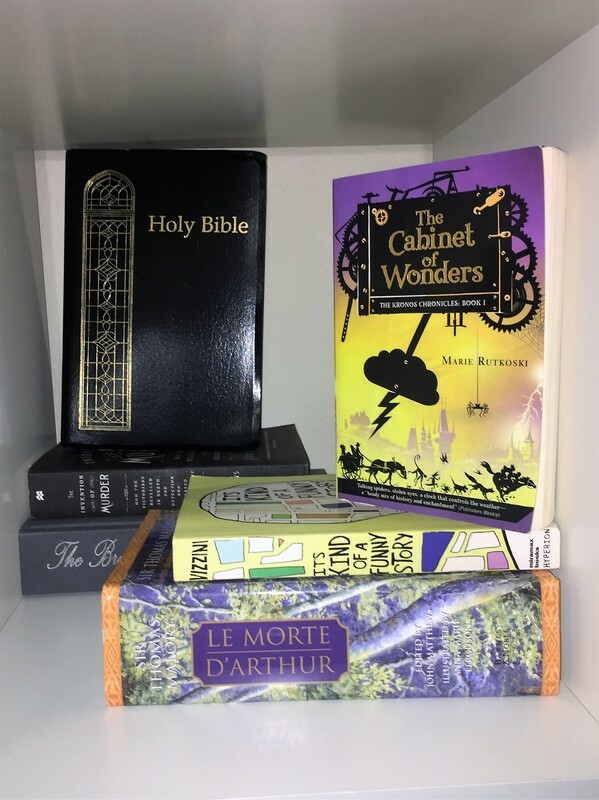 So after I finished Squirrel’s World, and took the quiz, I went to the bookshelf with all the books for the sclastithon, and picked the smallest of the chapter book I could find, The Cabinet of Wonders by Marie Rutkoski. The book took me a week to finish, but I finished it and took the quiz. I felt great, I felt like I was finally on par with everyone else in my class, and I was going to finish the other seven books to reach the goal of all twenty books! It took about a week for each book after that, and I took the quizzes for Mudshark, by Gary Paulsen, Calvin Coconut Trouble Magnet by Graham Salisbury, Dying to Meet You: 43 Cemetery Road by Kate Klise, Home of the Brave by Katherine Applegate, Jake Ransom and the Skull King’s Shadow by James Rollins, Umbrella Summer by Lisa Graff. Then there was only one book left 11 Birthdays by Wendy Mass, the biggest book out of them all, and I only had a week to finish it. I thought that there would be no way, but I put all my time into reading that one book, and somehow I finished. I went it and I took the little quiz I had to take for it and returned to book. All I could think of was how I had finally done it. That I was the same as all my other classmates. Later that month I had graduated from dyslexia class and I could have English class with all my other classmates. After doing the sclastithon I loved reading, and now I read a book everyday. After I finished all the books, I went to Barnes & Noble with my mom and we bought The Cabinet of Wonders, and I still keep it on my bookshelf now, with the hundreds of other books I now own.I had felt so great in 5th grade, I had conquered my dyslexia and I was doing the best I had ever done it school, but alas nothing stays. Through all these times in my life it showed me that I should do whatever I could to succeed, go out of my comfort zone, and that I value God's teaching. Even now I strive to make myself better and use my determination to get better. This is shown when I moved to Colorado out of choice, because I had lived in the same town for sixteen years, though my parent gave me an option to stay in Texas, but I needed to get out of my comfort zone. Going further out of my comfort school I went to a small high school that was focused on projects and presentations, which I have always hated, but knew I needed to get better at them. All these experiences have given my life meaning, and will continue to as I grow up.